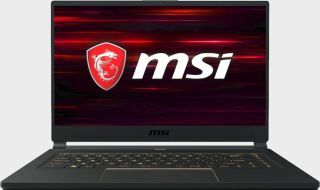 Deals A fantastic price for a thin and light laptop with a 144Hz display. Portable powerhouses These are the best gaming laptops you can buy in 2019. From high-end to budget, there's a gaming laptop here for you. Deals Being discrete on a budget. Deals Portable gaming on a budget. News New mobile processors will land this summer. News No need to bust out an external optical drive. Deals A well-equipped laptop for gaming at 1080p. News This is in addition to 50,000 laptop batteries that were previously recalled. News You can ditch the 3D shades now. News Turing hits the road. Deals This is faster than a lot of desktops. Cloud gaming We tested Nvidia GeForce Now, and found it usable, but only under ideal network conditions. News It's a shocking recall. News Just in time for Valentine's Day. News OLED displays typically deliver wider color gamuts, brighter whites, and deeper blacks. Deals Not only is the laptop itself 41 percent off, but it comes with $145 of free stuff. News Its Nvidia RTX graphics are already stacked, but the potential to upgrade later sweetens the deal. News That's a higher refresh rate than most standalone monitors. News The 'ROG Mothership' has landed. News 100-plus configurations will be available at the end of this month.